JRTV in Jordan takes delivery of new SNG satellite truck. Amman, February 2017: JRTV has been supplied a new uplink truck by Hitachi Kokusai Electric Turkey Systems. 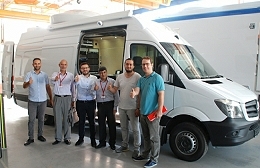 The SNG vehicle - which was built in Istanbul - is a Mercedes Sprinter van with a PDA 150 Ku Band Drive News antenna and 1:1 400W TWTA and MPEG-2/4 HD compression system. Omar Hikmat, CEO of Amman-based Heat for Engineering and Technology which collaborated with Hitachi to supply the vehicle, said: "In order to support JRTV’s field-based production teams we had a specific set of requirements from this vehicle. Hitachi’s ability to take a standard Mercedes vehicle and create a totally bespoke solution to our customer’s needs is impressive. It passed all JRTV’s acceptance tests with ease and already it is fully operational."